Clear out at the far end of the area was a nicely mowed grass area with a wide assortment of great looking cars. I found out later the Car & Motorcycle Museum was next to the field but we only took time to tour the interior of one museum. The trucks looked just as good. Lots of love and tender care to restore this old farm truck. We won't calculate how old it is since I think it was born the same year I was. Loved the Texaco fuel truck that was parked in the service station's service bay. If you find the service station, the car & motorcycle museum is located next to it. We were surprised to find a huge "flea market" with all sorts of stuff across the road from the service station. A true scrounger could have spent all day just cruising through the boxes, barrels, and tables full of stuff as well as the stuff that was too big for a box or barrel. There was a whole line-up of Rumley Oil-Pull tractors at the Great Oregon Steam-up but this is the only picture I have. I took two camera batteries but 600+ pictures later, the batteries were dead before the Oil-Pull tractors came through the parade. The Titan tractors were out in force as well. It was fun to note the different designs of the simple Titan radiators, the water flowing over hardware cloth to provide engine cooling. It looks like a steam-roller but used an ignition engine. If I recall the comments, they don't have any idea who the manufacturer was. This Heer is very rare and very advanced for the day. It had four wheel drive and four wheel steering. was the artistic hat the driver was wearing! This engine wasn't running at the show but had a very interesting history. This 200 hp. engine (and its twin) powered water pumps for irrigation in Riverside, California from 1928 to the late 1950's. It would run at full power for 24 hours a day for months at a time. The only known heavy maintenance in that period was the change of one cylinder in 1944. Smaller stationary engines were there by the hundreds. Some restored, others looking quite used. As usual, you can double click on any of the photos for a larger version. They held a parade at 1:30 which lasted 90 minutes. Not all of the equipment on site took part in the parade, but most of the operating steam engines did. This engine was built by Westinghouse. Who knew? I sort of figured that steam tractors were pretty rare - they said this one was very rare. This Case steam engine was retrofitted at some point with steering. Originally this one was designed to be steered by a team of horses, thus the seat mounted on the front left corner by the stack. A hybrid, long before we were talking about hybrid vehicles. We had carefully chosen grandstand seats in the shade for the parade which made photography less than ideal. I sure enjoyed the shade! This is the same tractor that was in the first picture where they were using the engine to power a large fan. This was one of two engines that were fitted with a small steam powered generator to power a headlamp. The dark grey "motor" was actually a generator, powered by a small steam turbine on the other end of the generator. The exhaust from the steam turbine is the vertical pipe alongside the smoke stack. The collage below is sized large so that you can see some of the individual detail of the steam tractors if you want. Like all my photos, double click to get the large version. Originally, the plan was to mooch a parking spot for one evening but we quickly realized that one evening would be inadequate so we changed the schedule and enjoyed these wonderful accommodations for several days while we played catch-up with long-time friends. Since we were in town, I wandered through the George Fox University campus. As a former college administrator, it's always fun to see other campuses. This one has lots of history. Their oldest building dates to 1887. They've done a great job of maintaining a cohesive campus with architecture spanning 120 years. The campus core was complete with a classic clock tower. Over time, the University has purchased neighboring homes as they went on the market and have moved support services out of the core of campus. The result is the retention of a well maintained neighborhood feel while providing for campus growth. The rest of Newberg deserves time to savor it. It's full of interesting places and some great eats. We ate lunch at Taqueria Guerrero and it was excellent. They have a new small bakery in town that makes incredible bread. Champoeg State Park is conveniently located to serve as a base while exploring the community. Our moochdocking host asked if we wanted to visit the Evergreen Aviation & Space Museum. I was going to turn him down since I think the museum is over priced with a $25 entrance fee and I'd visited a number of years ago. Turns out, he's a supporter and has free entrance for his guests through the end of the month, so we headed off to McMinnville to visit the museum. Because Evergreen's business roots were with helicopters, the museum once had a robust collection of helicopters. I only spotted two on this visit, but they do have the most important one (to me) still displayed. My early aviation career centered around the Hiller UH12 series so it was nice to see a survivor, even if it was decked out in spray gear. 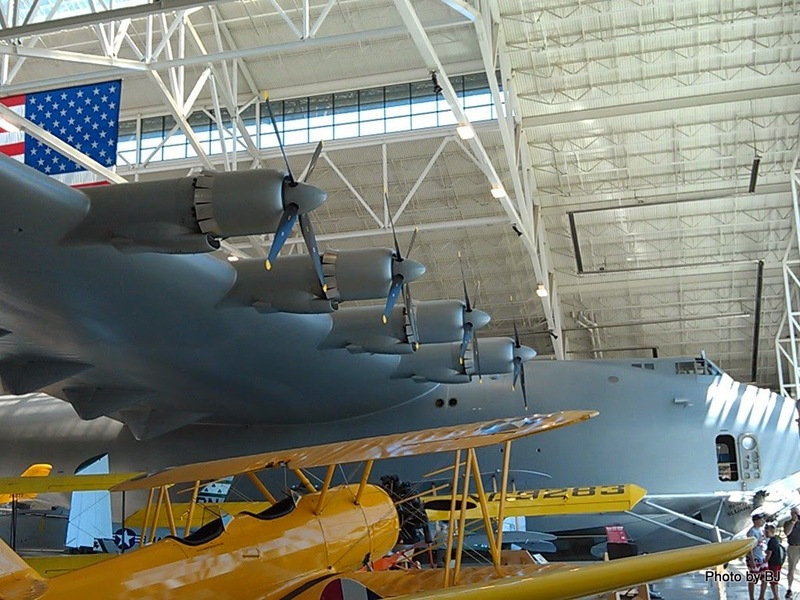 The centerpiece of the museum is the Hughes H-4 "Spruce Goose" which towers over all the other exhibits. It was impossible to get a complete picture of it from any angle. They've created a glass walled viewing room in the fuselage. It was challenging to try to get photos without reflections. Because the laminated wood structure is painted, it's impossible to tell at a glance that the aircraft is constructed of birch, not spruce. Eight Pratt & Whitney R-4360 Wasp Major "corncob" engines powered the aircraft. Each engine weighs nearly two ton plus the weight of the propeller. Given the massive size, it's easier to concentrate on assorted details. It's not every aircraft that sports bollards built in. I couldn't determine if the angles on the face of the beams were made of aluminum or painted, laminated wood. I decided I liked this offshoot of the Spruce Goose project better than the aircraft. Turns out there are a handful of these 7' dinghies that have survived as collector items. The boat is constructed with the same laminated birch materials and techniques as the used on the aircraft. I enjoyed the visit, but would have likely enjoyed it more if I hadn't visited previously. The collection has shrunk since my last visit, perhaps a reflection of some uncertainty given the bankruptcy and break-up of the component businesses of Evergreen International Airlines. If you're a serious aviation buff, I wouldn't put off a visit.